This is all David Lebovitz’s fault. Let me explain. I’ve never tried homemade cream puffs (sometimes called profiteroles) before, and in fact I was a little intimidated by them. The pate a choux pastry used to make the puffs just looked so delicate I thought there was no way I could make it without screwing something up. However, while paging through one of my Christmas gifts – Ready for Dessert by David Lebovitz – I came across a pate a choux recipe that looked, dare I say it, easy. Just combine a handful of ingredients in a pot and stir. Really? That’s it? Turns out, that is it. It really is just that easy. Since New Year’s Eve was just around the corner, I figured what better occasion for cream puffs. And not just any cream puffs. They had to be champagne cream puffs, of course. Look, if you can make pastry cream and you can stir things in a pot, you can make these cream puffs. And you definitely should, because holy deliciousness, Batman. I could not stop eating them. Literally. I had to send half of them to a friend’s house because I had eaten 3 before I even finished assembling them. I love that David Lebovitz’s pate a choux has flavor, something a lot of pre-made puffs lack. The champagne pastry cream was smooth and slightly sweet with a subtle aftertaste of champage that was just perfect. Combine the two, dip them in chocolate ganache, and stuff them in your face for any fancy occasion. I know it’s only January, but I’m pretty sure these will be the best things I will eat in all of 2011. I just can’t imagine they’ll ever be topped! It you would prefer to make half as many puffs, halve the recipes for the pastry cream and chocolate glaze and freeze the other half the of the pate a choux puffs for later. You can also skip the chocolate glaze in favor of a dusting with powdered sugar. These cream puffs are best served within a few hours of assembly, but if necessary hold up fairly well when chilled in the refrigerator overnight. Prepare the pastry cream first. Chill for at least 2 hours or up to overnight. Prepare the chocolate glaze an hour or so before assembly to allow time to firm up. When ready to assemble the puffs, cut a small X in the side of each puff about halfway between the top and bottom. (You can do this in the same place you poked to release steam.) Fill a pastry bag fitted with wide-opening decorating tip with the champagne pastry cream. Insert tip into the X in the side of each puff and gently fill with pastry cream. Once filled, dip the top of each cream puff in the chocolate ganache and set on a rack to firm up. Serve within a few hours, or if necessary refrigerate overnight. Resist the temptation to replace part of the heavy cream with milk. The acidity of the champagne will curdle the milk. In a large bowl, whisk together cornstarch and 1/2 cup of heavy cream. Set aside. In a saucepan, combine remaining 1/2 cup of heavy cream, champagne or prosecco, and sugar. Bring to a boil, stirring to dissolve sugar, then remove from heat. Beat the eggs and egg yolks into the cornstarch mixture. While whisking constantly, slowly pour about 1/4 cup of the hot heavy cream mixture into the cornstarch mixture to temper the eggs. Return the rest of the heavy cream mixture to heat and return to a boil. Pour the cornstarch mixture into the pot, whisking constantly until the pastry cream reaches a pudding-like consistency. Remove from heat. Stir in butter and vanilla extract. Pour pastry through a fine mesh sieve into a large bowl to remove any lumps. Cover and chill for at least 2 hours. Fill a large zip-top food storage bag (or pastry bag) with the dough. Snip 1/2 inch off the bag tip and pipe small mounds of dough about as wide as a quarter and 1 inch high (about 1 inch apart) on the prepared baking sheets. You should get 20-24 (5 or 6 rows of 4) per baking sheet. Bake one sheet at a time at 425°F for 15 minutes, then lower oven temperature to 375°F. Continue baking for another 10-15 minutes, or until puffs are golden brown on top and sides. Turn off oven and let puffs sit in the oven for 5 minutes. Remove from oven and poke each puff on the side with a paring knife to release steam. Cool completely on a wire rack. Use puffs the same day they are baked, or freeze them in a zip-top freezer bag for up to a month. I know you SAY that these are easy but I maintain that they are still quite a feat! So decadently beautiful. You certainly started out 2011 with some serious class. These look beautiful! And they sound absolutely delicious. 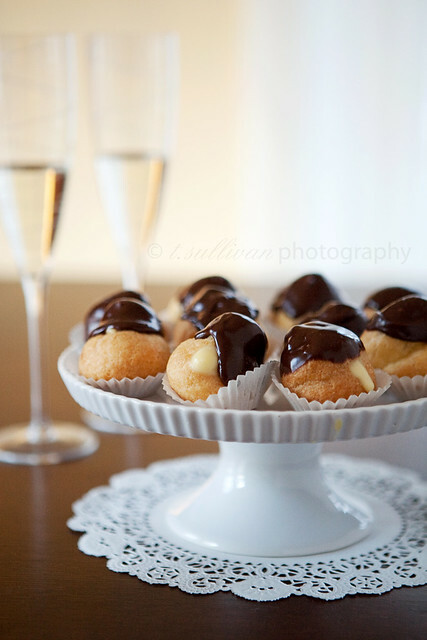 I recently tried my hand at making pate a choux/ cream puffs too and I am absolutely hooked – what a great way to start off the New Year! A lot of things that are dislish are David Lebovitz’s fault! These look fantastic, you’re photography is beautiful! I’ve always wanted to make cream puffs, but been seriously intimidated. I’m definitely going to have to try this recipe. Thanks for sharing! These look delicious! 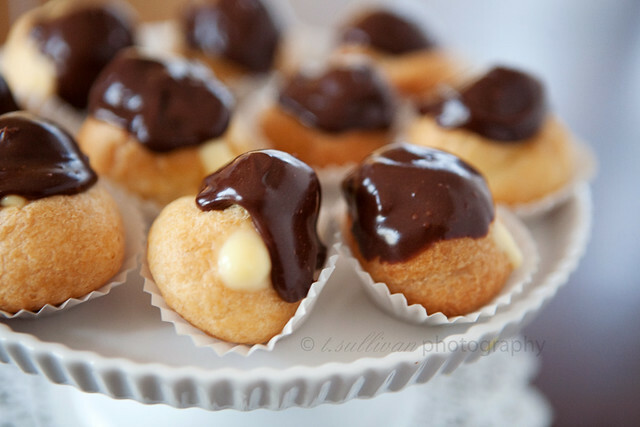 I love cream puffs, and I can’t wait to try this recipe! I found your blog in the PW, congratulations on being chosen for 1st Food Group! Every week we have a Monday Morning Bake-off at work to kill some of those Monday Blues. My turn up is coming up on Val’s Day. I wonder if I have the guts to give this recipe a go? They look gorgeous! Ohh, lovely! Champagne + cream + chocolate? How could these possibly be bad! Yum. They look amazing! I will feel so pampered if someone makes them for me, served with a glass of champagne! These will be outstanding for Valentine’s Day. You have inspired me to get over my fear of Pate A Choux. Thanks! Wow – gorgeous! Lovely decadent dessert. You should consider sharing it with a few more folks over at the weekly Saturday Decidedly Healthy or Horridly Decadent blog hop. I’ve made cheese puffs before but never cream puffs. These look delicious. Next time you’re looking to get rid of some, send them my way. Please and thank you. They all look wickedly yummy :p Can I have some please?